The Warrior is a complete zero waste system. Everything has its place and designated pocket, which means you know when you have forgotten a component before you leave the house. 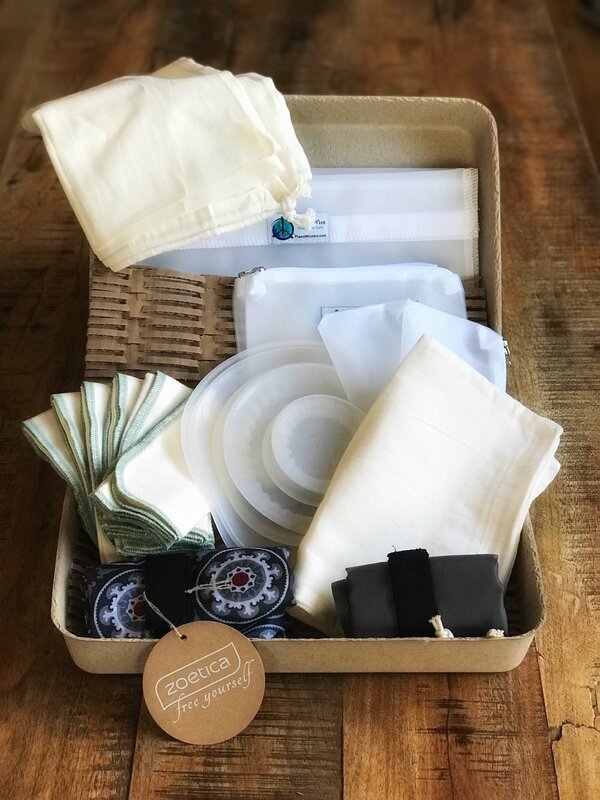 We carry this system because we care about fashion and style, and we also demand durability, washability and organization. The outer Warrior bag is incredibly well made, resistant to dirt and stains, and water resistant in the rain. We love the inner RFID pouch for international travel. It is so empowering to have every single zero waste component you need, even when you don't know what your day will hold. There is plenty of room for personal stuff - your glasses and Kindle, wallet, phone and more. You can even fit a Bag of Bags 4 in here to always have your grocery shopping Zoetica system with you. We love the quick access phone pocket on the side too, as well as a key hook inside to keep your keys from getting lost in the stuffle. Seems a little pricey to you? Remember, it is designed to last forever. Also, having all the dedicated pockets makes you less likely to lose parts and keep buying cups and water bottles on the go. Read below about The Nomad and each individual component of this kit! 90% of people carry backpacks to work, play and travel. We took the most durable, stylish and beautiful backpack design we could find and converted it into The Explorer - a complete zero waste system. We know that you care about fashion and style, and demand durability, washability and organization. This backpack is the best combination of these features that we could find. We love that the design is widely appealing to men, women, college kids, high school students, travelers, and urban professionals. The colors are classic and timeless. We love the RFID pouch for international travel safety for credit cards and passport. We love the outer pockets because your water bottle and coffee cup are easily accessible all the time, and you'll know if they are missing. The Nomad pouch fits so easily in the front pocket. This leaves plenty of space for your laptop, personal items, wallet, books, glasses, and travel pillow - even your groceries for the bike ride home. Read more below about the Nomad and each component of this system. We love that you get to choose which kind of stainless steel tiffin set is right for you. The Wayfarer has a reusable cup for those inevitable times when you forget your own (we all do it!) We love this stemless wine shaped cup on the plane for wine, cocktails, beer, coffee, tea and juice. Most flight attendants will thank you because most of them are appalled by the trash they throw away every flight. We have just designed and added a bunch of new pouch styles and colors and keep adding new options to appeal to many different tastes. Read below about the components in this system and why we love them. We love that you get to choose which kind of stainless steel tiffin and which cup (top or no top, simple or more highly functional) is right for you. Our smallest, most compact and most affordable system is designed for saving space while still practicing the zero waste approach. Sometimes having something small, lightweight and easy to bring along improves the chances that you will have what you need when you need it. The Nomad is a great solution for students and kids too. We insert this system into The Warrior and The Explorer to compliment an outer carry bag and a complete hydration system (water bottle and coffee cup). We love the diversity of sizes and shapes, fabrics and styles we can offer in this system - crossbody straps or not, one zipper or three, your choice of tiffin set. So much versatility. We cannot even begin to tell you all the hundred ways in which we use these incredible replacements for the Ziploc bag. Once you get a few, you will wonder why it took so long to get rid of the dreaded ziploc from your kitchen, travel, lunch, refrigerator storage and more. We love the ease with which we can clean them (turn them inside out and place them on the top shelf of your dishwasher!) We love the three sizes from snack sized to sandwich/quart to gallon. Karen puts tea bags in them and carry her favorite organic teas in her computer bag all the time. She also stores dried fruit and nuts in them to always have a healthy snack on the go. Elizabeth carries a sandwich to work. We have our local greens delivered in them and use them at the farmers market. We use them for kids lunches and for storing leftovers in the fridge. We also use them as a doggie bag at the restaurant. They fit easily in a purse or back pocket so you can avoid those awful plastic to go containers at the restaurant. This water bottle is also double walled like the coffee mug and keeps my beverage hot or cold for hours. I love it because it is the perfect size for everyday use and travel. It fits in the counsel of my car, my purse, and my backpack. Living at 9000Ft. it is a challenge to stay hydrated and since this is with me all the time I seem to drink more often. The sleek design with the flat edges and tapered bottom make it very easy to slide it into the Warrior or our Explorer kit. It is not big and cumbersome like so many water bottles. There is no issue with a top that leaks since it screws on and has a great seal. It is lightweight and very durable. 2 million water bottles are sold every minute around the world. It is so easy to carry your own bottle. Most airports, and public spaces are providing water bottle refill stations for this very reason. I love the large Z Cup like the Z bottle it is double walled and keeps my beverage hot or cold for hours. The two flat sides make it easy to hold and carry. It also makes it easier to fit in the counsel of your car or and purse or backpack. The top fits snugly and accommodates one of our stainless straws. The size is perfect for a smoothie, iced Chai, fresh juice or a beer. The top and cup are totally dishwasher safe and the gasket doesn’t disappear like so many we have tested. These are so durable and have a very long lifespan, I really like giving these out to those people who use a plastic line paper coffee cup with a plastic lid 365 days of the year. It is a great gift ot initiate the awareness. We love the Ukonserve tiffins. The 30oz tiffin is a great size! It is deceiving in size and looks much smaller than it is. It holds more food than I can usually consume. I use it to bring my lunch to work and to pack my kids lunches. I have them at home and I keep it in my warrior kit in my car so when I grab a meal on the go I can use it instead of a Styrofoam or plastic to go container. I love it for the salad bar at Wholefoods, breakfast and lunch to go restaurants or to carry leftovers home after a meal out. It is durable, and leak resistant. The lids seals tightly so the chances of spilling are slim. The smaller 16, 9 and 5oz sizes are perfect for kid lunches, salad dressings, nuts and fruit. I use them for food storage in my refrigerator. They nest together nicely for travel or on the go. The stainless round tiffins by Onyx are leakproof, super compact, light weight fit easily into all our kits. The 24oz is great for salads and soup. We have filled these with water and tested their ability to not leak, so we feel confident saying that they can be carried within our kits full of liquid. There is a hefty silicone seal around the lid that allows these to seal well and reliably. These are so great nested together in the Nomad and Wayfarer, and fit easily into your Warrior or Explorer for on the go travel. I have eliminated those small lunch ziplocs that used to fill my kids lunch boxes that I would toss away everyday and now I just use these to pack their food. We love the size of the 24oz because it can fit a large salad or soup. But our absolute favorite is the Z-Bento! Are you tired of that enormous, cumbersome pile of bags in the back of your car that you can’t wash? Our Bag of Bags is compact, light, washable, durable and the size of a book. It fits in your purse or takes up little space in your luggage when traveling. We offer a large and small option depending on your family size. The Market totes carry 60lbs and are easily washed and they fold up to be about the size of a cell phone. Included in the Bag of Bags are a few produce bags that eliminate the need for all those plastic produce bags. 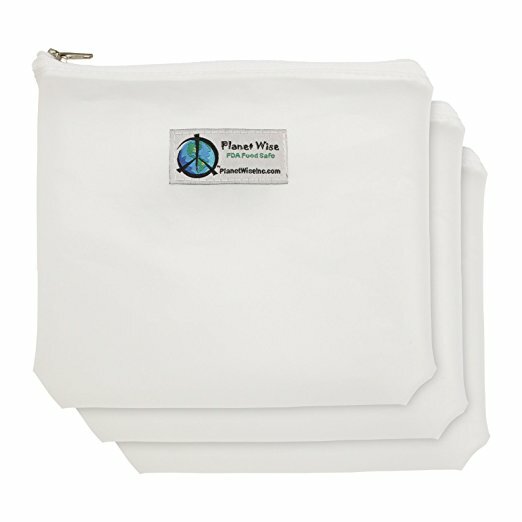 These are made of organic cotton and are machine washable. Mine hangs behind the driver seat so it is ready to use. I also throw it in my suitcase when i leave for a trip. It is the perfect gift for that friend who wants to start making a new step towards banning plastic from their lives. Perfect starter kit for the person who wants to make their kitchen free of plastic. Lekue and Planet Wise products are durable and so easy to use. We have tested and tried all of these products in our own kitchens and these are the ones we chose out of many that didn't work very well. I love this for summer BBQs, conventions, parties, music festivals… I keep it in the back of my car because you never know what comes up and when you might be walking into en event that has stacks of paper plates (or sometimes even styrofoam! ), plastic cutlery, and plastic cups. It is easy to travel with and it makes a great stirrer as well as a great lightweight travel companion. We love this lightweight, compact water bottle. This is a great one to throw in your ski jacket for those water breaks. Another great travel companion. I love the ease of using these to store my food. They are easy to use and easy to clean. No more plastic wrap! These are so absorbent that I have a stack in my kitchen to use instead of paper towels. I have a few in my car too. They are made from organic cotton. I love that these are made from Bamboo husks and are so elegant, durable and stylish!